Hobie Forums • View topic - Hobie Wave cam cleat position, up or down? Hobie Wave cam cleat position, up or down? Post subject: Hobie Wave cam cleat position, up or down? On the Hobie Wave, should the cam cleat be positioned such that it locks when the sheet is pulled at a downward angle or an upward angle? I sailed last weekend on one with the cam cleat mounted so you pulled upward to lock, and found it very awkward to have to be leaning downward to free the sheet and otherwise to sail with the sheet running free. It seems far more logical to have the cam cleat mounted so that one pulls downward to lock, an overt forward lean, and otherwise have it run free when you're sitting in the normal upright or upright-back-leaning position. Post subject: Re: Hobie Wave cam cleat position, up or down? Best if you don't cleat every time you pull in, so the line is easily released if needed. As you gain skill you may want to cleat every pull, but I almost always release and hold the line in any conditions where in the windy or gusty. Just safer. There is a technique to learn to release the cleat. Keep lite pressure on the line. Lift and quickly snap downward to send a "wave" of line at the cleat. Done correctly the line pops out of the jaws. Easier done with jaws down. You say "easier done with jaws down". So I think you're agreeing that the normal condition is to have the sheet running free with jaws down, the sheet being waved or pulled down into the locking jaws only by overt action when needed (e.g., when tacking or on long reach with wind direction constant). Just want to be sure I'm understanding your reply. Many thanks. By the way, my recent Hobie Wave sail with my granddaughter was magnificent (except for the upside-down mounted jam cleat), Eagle River area in northern Wisconsin, prefect weather, fairly constant wind. Ooh la la! Jaws down... standard configuration. Pull up to cleat. Wow, am I feeling a dunce! You're very clear in your last response that I do have it wrong. You say "jaws down ... pull up to cleat", even to a hard head like mine, that's pretty clear. 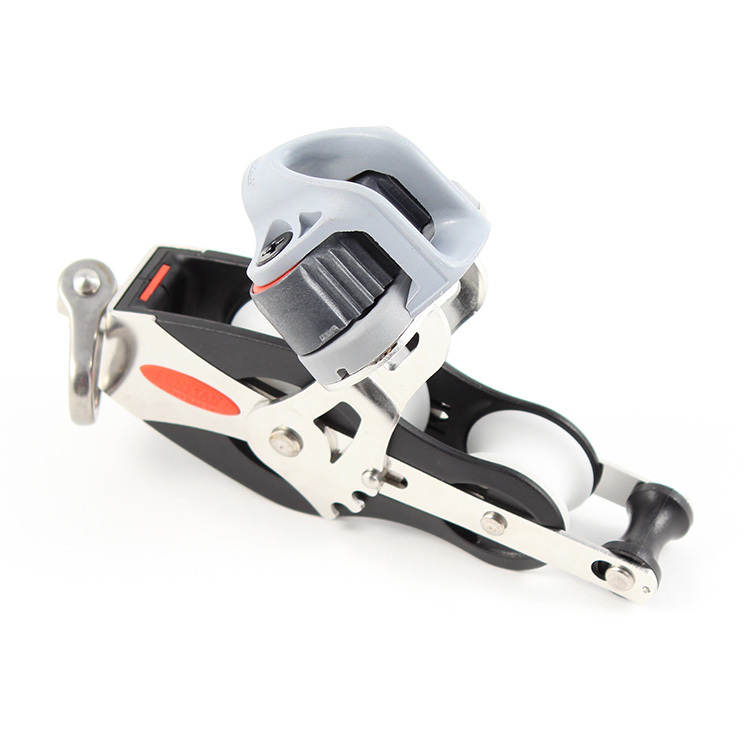 So for an upright-sitting sailor to have a continuously free-running sheet, he/she has to be handling it at a downward angle to the cam cleat the whole time, be holding the sheet down low, any upward angle pull automatically locking it. Just sitting here on dry land this sounds so backward, but guess I'll get the physical logic of it next time I'm on the water. Most models allow angle adjustment. Wave blocks allow some jaw angle adjustment. There are three positions. In moderate, more consistent breeze, I adjust lower to cleat as I sheet. In challenging conditions I may adjust higher to prohibit cleating unless I want it cleated. In the image below you see the current block. There is a spring loaded pin engaged in the angle adjust teeth. You pull up on the pin, adjust and let go. Orientation of the block in the image is sideways. Top to the right... bottom to left. This seems to make more logical sense in the way the Wave mounts the cam cleat. The one I use is an older model, but I'll take a look, possibly allows similar adjustment. Many thanks for sticking with me on this, shows real back-up to a fine product. No problem! Under sailing loads the angle of the jaws can/will vary on sheet tension, so maybe hard to replicate on shore.